Home Quality Assurance How to use WinRunner through case studies in Software Testing? How to use WinRunner through case studies in Software Testing? First of all, I would like to give the brief description about WinRunner. It is a powerful automated testing tool developed by Mercury Interactive Company since it is basically used for functional regression testing. Also, It automates the testing process. Hence, to ensure that the applications performing as we expected or Not. It records operations as you perform them manually in your applications build and generates a test with required observation as checkpoints. In addition, you can run your test on application build and analyze the result manually with respect to the corresponding manual test case. Then, WinRunner enables you to adapt and reuse your tests for regression and protecting your effort in test creation. 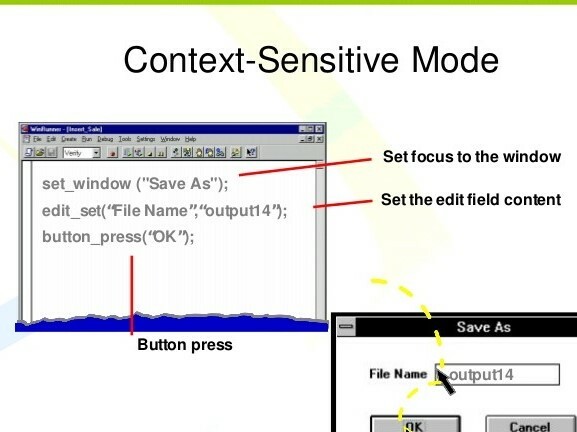 We are going to discuss various techniques and modes to record (like context sensitive and analog) a test case using win runner. 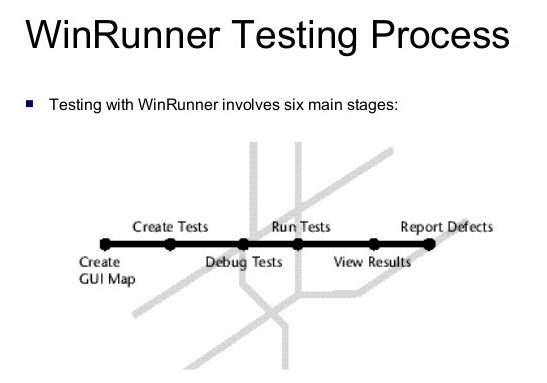 So, we will understand how one can use WinRunner effectively to make the testing job easy. WinRunner is a functional testing tool. As a result, it supports various technologies like VB, JAVA, Power Builder, DotNet, VC++, HTML, Delphi, Activex and ERP/Siebel technologies for automated functional testing. It runs on a windows family operating systems only. WinRunner converts our manual function tests into test script language (TSL) programs. First of all the automation test process starts with the selection of manual test cases to be automated by a testing Engineer. 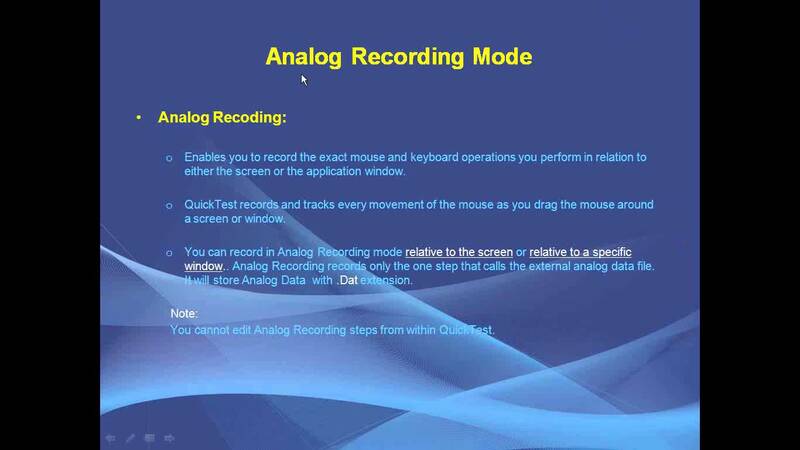 After completing the first stage then, create the test using both recording and programming. Therefore recording tests, insert checkpoints where you want to check the behavior of the application under test(AUT). While running test cases, WinRunner emulates a user by entering mouse and keyboard input into your application. So, Each time the WinRunner encounters a checkpoint in the test, it compares the current response of your application to its expected response. 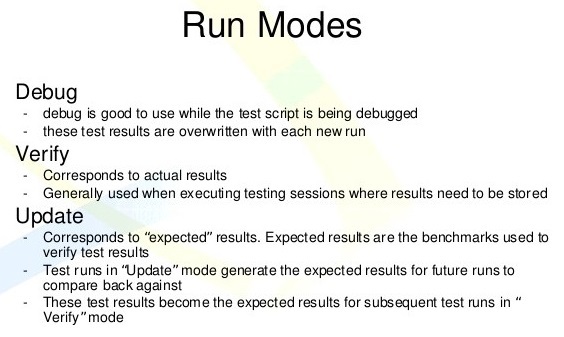 Analyzing automated test scripts results: When a test run ends, Furthermore, the test engineer can examine the result. While WinRunner lists all the major events that occurred during the run such as checkpoints. Precondition: user ID and Password fields should take values. Finally, every automated test script program consists of navigational statements to operate build and checkpoints. To conduct required functional observation with respect to the corresponding manual functional test case. So, the scripting language tests script language for automating a manual test case. Because it is mercury interactive C-like Test scripting language. Therefore you create a test script by recording or programming TSL statements. First of all, you need an Add-in manager window, as shown in the figure. After that, list out all WinRunner supported technologies with respect to purchased Add-in licenses. So, this window will open while launching WinRunner on our desktop. WinRunner also allows you to create automation test on selected technologies, which are used to implement your software build, in Add-in Manager. In above picture, a test engineer already selected ActiveX controls, PowerBuilder, and VisualBasic options. For this reason, WinRunner supports tests creation on your software build which is developed using selected technologies. 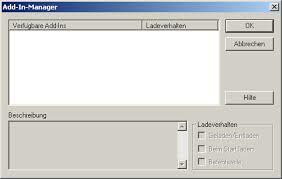 Select Add-ins to load: This part in Add-in Manager dialog which displays the Add-ins you can load WinRunner. Although, The Add-ins you selected would automatically appear the next time you start WinRunner. Time progress Indicator: This part in Add-in Manager dialog displays the remaining time to load Add-ins until that dialog closes. Show on Startup: Basically, this part in Add-in Manager dialog indicates that you can display that dialog every time you start WinRunner. 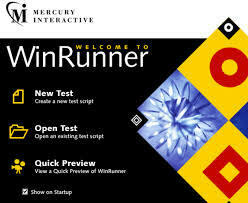 Add-in License: WinRunner 8.0 includes the Activex controls, PowerBuilder, Visual Basic.Net, and Web test Add-ins. 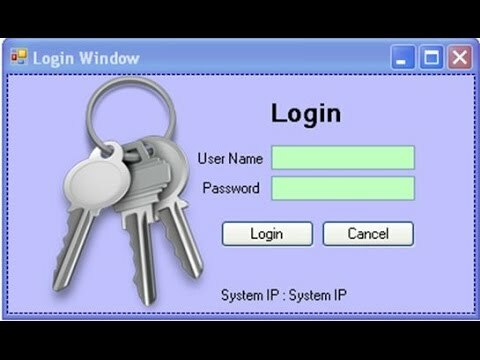 You can also purchase and install additional External Add-ins, if you use a seat license and install external add-ins, you must also install special add-in license on your computer. Then, click the Add-in License button to install your Add-in licenses on your computer. After selecting Add-in technologies in Add-in Manager, The tester should continue loading WinRunner, therefore it returns a welcome screen. Create a new test: It is used to start test creation on the build. Open an existing test: With this option, you can open previously created test. View a Quick preview of WinRunner: This option enables you to see the preliminary help of WinRunner tool for test creation and execution. Exit: With this option, you can close the current instance due to WinRunner. Once the WinRunner is launched on the desktop, the test engineer can open corresponding stable build for test creation and execution. While in this test creation and execution of the build, test engineers use the following buttons regularly. A. Record Button: Basically this button is used to start recording of manual operations on our application build. Hence it is an initial point to create an automation test script. B. Verify button: It specifies run mode to run the automation test script on the application build. C. FromTop_button: It is used to run the automation program from the first statements. D. FromArrow_Button: This button is basically used to run the Automated programs from selective statements. E. Stop_Button: Stop_Button is generally used to stop recording and running of Automation test script. Basically, It allows you to record the manual operations in two types of modes namely Context Sensitive mode and analog mode. A. Context Sensitive Mode: It is the default mode in WinRunner. For this reason, WinRunner records mouse and keyboard operations with respect to objects and windows in your application build. Then, it records the operations you perform on your application by identifying graphical user interface GUI objects. Furthermore, If you start recording in context-sensitive mode, Then WinRunner displays the following script as shown here for manual operation. If all required actions or operations are recorded, you can go to stop recording using any of the following options. Description->While running in verify Run Mode, WinRunner compares the automation test scripts specified expected values with build actual values. Description-> At the time of running in an update run mode WinRunner takes default values same as expected values of checkpoint in your automation test script. Description-> When we run Debug Run Mode, WinRunner runs the automation programme statements while statements for debugging. Generally, the test script you create with is written in text script language(TSL). TSL is a C-Like programming language which is specially designed for testing. Hence, It is a high-level language and easy to use because it provides all the concepts of conventional programming languages with functions to improve test efficiency using WinRunner. Therefore, This enables you to modify record test script or to write sophisticated test scripts. However, there are four types of TSL Functions. Each type of function addresses a different requirement. basically, these functions perform mouse and keyboard input operations with respect to screen coordinates. These Functions Perform basic programming language operations, such as basic input and output, control flow, mathematical, and most of all, array functions. These functions configure the testing tool according to your requirements, like much as add functions to the generator functions, So we create custom GUI Checkpoints. Basically, checkpoints define a verification or condition on a testable functionality of software build. So, It is a functional testing tool and it provides facilities to automate the following coverage of an application. To Automate these coverages, WinRunner provides various type of checkpoints. Case study: Mapping between some object type and testable properties shown in the following table. Edit Or Test Box Enabled,Focused,Range,value,Regular,Expression,Date. 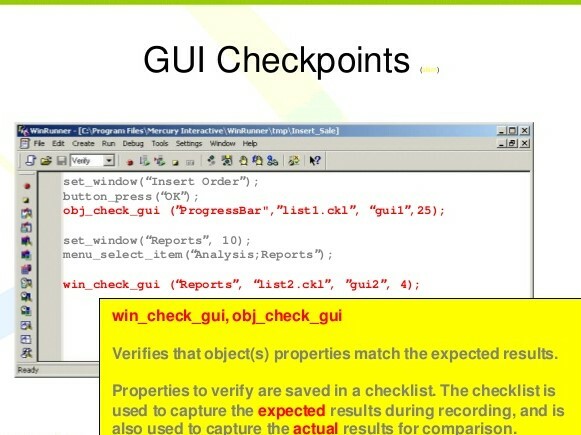 First of all, we should know that- to Automate backend testing, test Engineer generally use this checkpoint in WinRunner. Hence, at the time of backend testing, test engineer validates the impact of front-end operations of backend tables in terms of data validation and data integrity. While Data validation means correctness of inserting new values into a database table. Data integrity means correctness of changes in existing values. These days every application demands its own database for storing various information. At the time of testing the application, the database of that application should also be tested to ensure that the values entered into the database are correct. While, in WinRunner, For Checking databases, we have a feature called database checkpoint. Since Database CheckPoint consists of three sub-options. Last but not the least, automated testing with WinRunner addresses these problems by dramatically speeding up the testing process. Finally, you can create test scripts that check all aspects of your application, and then run these tests on each new build. So it simulates a human user by moving the mouse cursor over the application, clicking Graphical User Interface (GUI) objects, and entering keyboard input—but WinRunner does this faster than any human user. Previous articleHow to setup Android P preview version in Android Emulator? Next articleHow to work with File Input/Output Stream classes? How to connect Salesforce with Power BI ?